The Medi Mediven Elegance Class 2 Black Thigh Compression Stockings with Top Band are compression stockings from Medi, one of the UK's leading compression stockings manufacturers. They're designed to be as fashionable as possible while still delivering the compression you need. They give a moderate compression level of 23-32 mmHg. The contoured heel in the Medi Mediven Elegance Class 2 Black Thigh Compression Stockings with Top Band ensures a wrinkle-free fit for comfort and attractiveness. The top band on the Medi Mediven Elegance Class 2 Black Thigh Compression Stockings with Top Band features a floral pattern, adding an extra level of style to the stockings. They also feature a double heel reinforcement, making the Medi Mediven Elegance Class 2 Black Thigh Compression Stockings with Top Band even more comfortable. The Medi Mediven Elegance Class 2 Black Thigh Compression Stockings with Top Band features Clima Comfort, which reduces sweaty feet and stops skin from drying out. Clima Fresh keeps the stockings fresh and hygienic by preventing fungus & bacteria from sticking around. 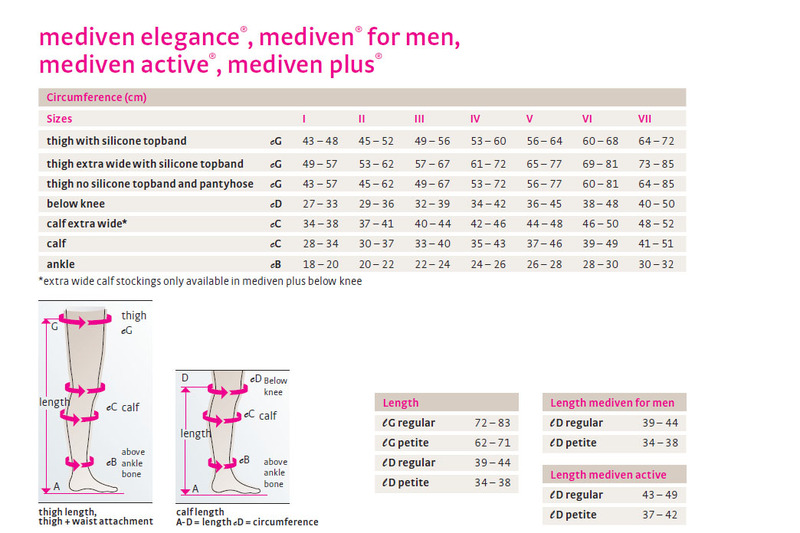 Medi Mediven Elegance Class 2 Black Thigh Compression Stockings with Top Band are non-returnable and non-refundable on grounds of hygiene.